Just doing final bits to Brew Street for the NEC (it will be on the Model Rail mag stand). I have very limited space, so the fiddle/staging yards are just a couple of modified cassettes. They clip on either end as and when required. The built in lighting holds its own even in daylight. Punters at shows are like moths, they are attracted to bright lights. Tip; if you have a really crappy layout, light it nice and brightly - they'll come flocking to it like bargain hunters to the model railway manufactures' when they're flogging off all the old tat at the NEC Warley Show first thing Saturday! 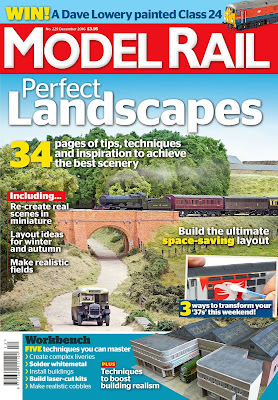 Part 1 of my little microwave sized nano-trainset has just appeared in Dec 2016 Model Rail magazine. The feature covers the first stage of the build, with plenty of illustrations of my kack-handed bodgings which try to fool people in to thinking that I know what I'm doing. 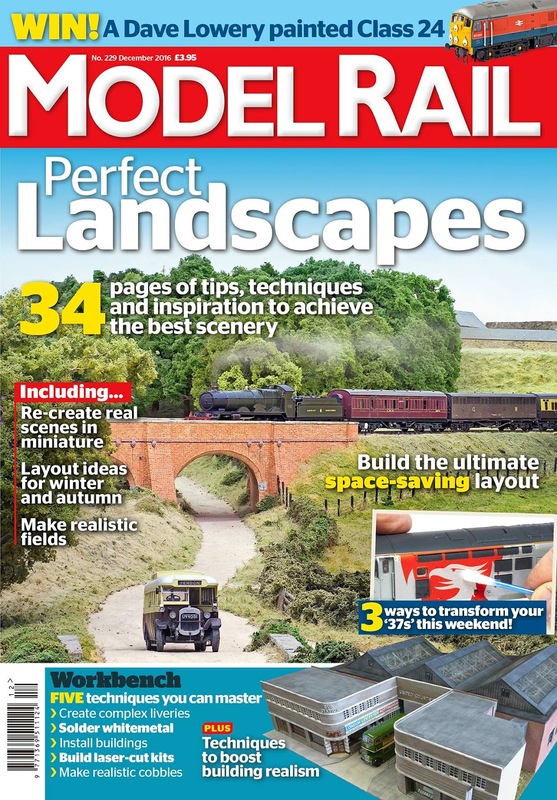 Yesterday, I penned part 2 for the January 2016 issue of Model Rail which will be out in around 4 weeks from this blog date. Or if you're reading this post in 5 years time - look on Ebay! The photo above is destined for part 2 - don't tell my editor though! 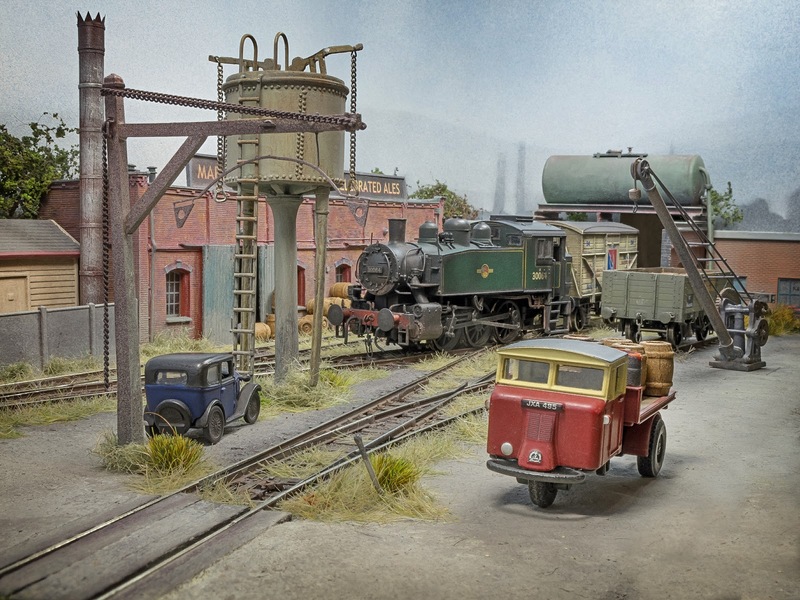 The little 'trainset' should be on the Model Rail stand at the NEC Warley Show on 26/27 November 2016 for people to poke, prod and generally comment on just how much smaller it is than they thought it would be. It really is small, imagine a foot print two A4 sheets of paper end to end - that's it! First stage of weathering up the Model Rail limited edition USA tank. I don't want it to look like it's been in Barry Scrapyard for 5 years like many do, more a warm oily rag look of a working engine. Click for a bigger version. I'll leave it for a few days before tackling it again with finer localised weathering. Weathering is best something not rushed, it's easy to overdo things in 'one sitting'. I'll need to sort out a crew too. A little signal box I knocked up in the very early 1980's from plastic card, bits of card and some clear packaging. It needs a little tender loving. Click on the above photo for a bigger view. It's survived 35 or so years quite well. The celluloid glazing (with frames drawn on with a bow pen and gouache paint) has distorted over time sadly. Some nice etched frames would be nice, but it's unlikely I'd be able to find something off the shelf. Might have to dig out the bow pen again and a slightly stiffer clear plastic sheet. The little building is based on a standard London & South Western design, I think from some plans in a magazine from the time. Magazines 'back in the day' would often feature such plans drawn to popular scales. The scale of this model being 1/76. 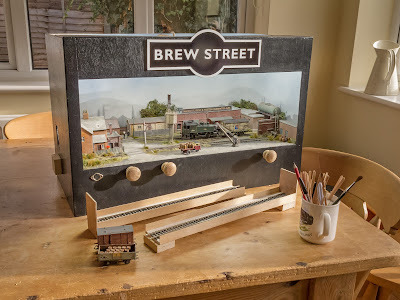 I've posed it on my latest little project (purely because it has some nice bright lights built in) called Brew Street. Use the Combwich and Brew Street 'labels' below for more about those layouts.